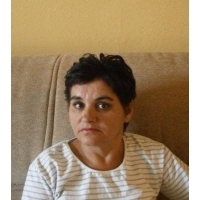 Branka has written haiku since 1991 and publishes in a number of magazines, joint collections, and on the Internet. Besides haiku and senryu, she writes modern poetry, poetry for children, prose, satire, aphorisms and book reviews. Evenings of Poetry (Bulgaria, 2013). Credits: "hide-and-seek" - Knots: The Anthology of Southeastern European Haiku Poetry [edited by Jim Kacian and Dimitar Anakiev] (Red Moon Press, 1999); A Dozen Tongues 2000: Children in Haiku from Around the World [edited by Jim Kacian] (Red Moon Press, 2000); "gipsy tents leaving" - Apokalipsa 42/43 (Slovenia, 2001); "noiseless steps" - Apokalipsa 42/43 (Slovenia, 2001);"shining snow - Paun 19-20, 21-22 (Poega, Serbia, 1992-1993); "with bronze" - The best Summer senryu, Diogen pro cultura magazine (Sarajevo, Bosnia and Herzegovina 2012);"blue lilac" - Joint haiku collection (Odaci, Serbia, 1996).